Remember, you can enter twice daily until the grand prize winner is determined in January 2012. 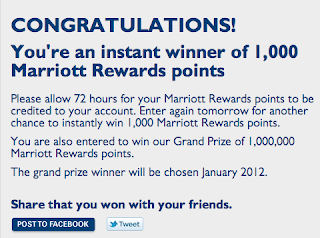 You may find more information about the Marriott Facebook Sweepstakes in here my earlier post. Also, for those who use Twitter, you can earn 500 Hawaiian Airlines miles simply by linking your Hawaiian Airlines account to your Twitter account. If you don’t have a need for Hawaiian Airlines miles, you can transfer them to Hilton HHonors points at a rate of 5,000 miles for 10,000 points. 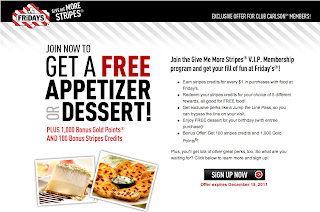 Don’t forget that TGI Fridays is having a promotion for new members which you can earn 1,000 bonus Club Carlson Gold Points and 100 bonus stripes credits to use towards free food rewards when you join by December 18, 2011. Plus, receive a complimentary appetizer or dessert! Sign up here.